It has been a whirlwind week for me and I'm glad the weekend is here. Besides reading a brief mention about Michael's next film, The Snowman, having its sneak peak trailer being shown at a film festival somewhere in Europe soon, I'm anxious to see it soon because now is the perfect time to prepare people for another Fassbender film. Meanwhile, Alien Covenant opened in China this past weekend and earned another healthy $30 million to its box office. I was dismayed to read that Chinese censors not only removed very scary scenes from the film, but they also removed the Walter and David peck/kiss. It's just so damn unbelievable that people are so primitive and warped in their thinking that an actor, playing two androids, having a 1 second chaste lip peck is something so tragic that it had to be edited out because of so called moral laws in China. I'm not even going to go on a political rant, I don't have the time or energy. I do want to mention that the latest rumor did make me giggle so hard that I snorted in the office this week. The Daily Mail reported that reportedly, Michael and Alicia are reportedly living together in London. I'm using the same number of 'reported/reportedly' that the Independent article uses. So many people believe this that if I were a person of questionable character, I would sell them land in Flint, MI and become very wealthy. Yes, I went there. One minute we have very, very believable and solid information, right from the horse's mouth, aka Fassy, that he doesn't live in Hackney anymore, not even in London, and that he was living in Europe. Then it was reported, right down to the actual property in Lisbon, Portugal, where Michael dropped some serious Euros on his beautiful new home. And now... it's "reported" that Michael and Alicia are living together in London. I don't believe it, but, some do, and, I guess, whatever makes people happy in their fantasies. Me, I love Michael as he is, and will see his movies regardless of his personal life. As long as he doesn't kick puppies down the stairs, I got his back. 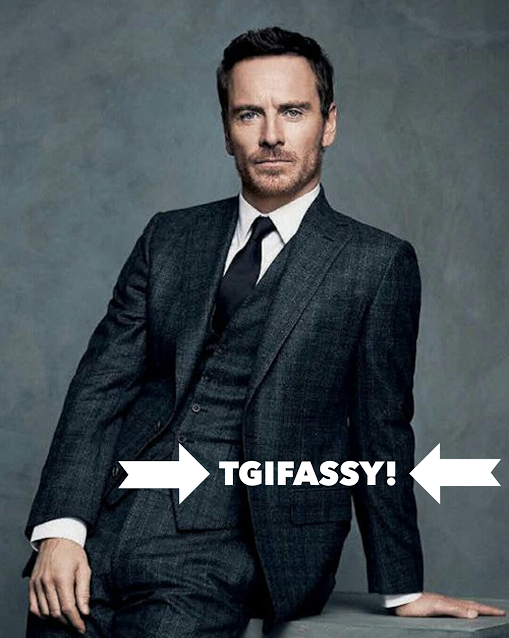 TGIFassy! font text from this point forward will be done via Word Swag, an app I had to purchase so I can be more creative with text on images for social media purposes. I'll be a lot more creative with Michael Fassbender images here on the blog, on Twitter and Facebook.